These are the author’s memories of events and personalities garnered over almost seven years military service with the NATO armies in Europe. That service took place in stretches of one, two and three years, between 1955 and 1969 — years that covered the most sensitive periods of the Cold War. 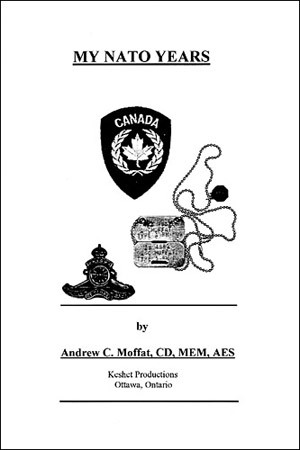 The author had an unusual range of experiences, for he served in both the Canadian Brigade Group Headquarters and as an Operations Officer in the Northern Army Group Headquarters. Too, he served in a Field Artillery Regiment as well as Commanding Canada’s only operational nuclear unit. These memories cover the entire range of his experiences and speak directly and indirectly to many of the personalities with whom he served. It is difficult to read this book without imagining the parallel life lived by the author’s wife and family. It is not only the soldiers who serve our Country with dedication and perseverance! “We favoured the ‘CAT & Mouse Pub’, just down from St. James Church,” said Bill. “Oh, yes,” Bill came back. It was at this point that we all became conscious that the voice came from other than the four of us. It came from the chesterfield behind Bill and Joe, and the only person there was the ship’s doctor whom we had seen enter earlier. My 15-year old image of an Me109 pilot had proven accurate in every detail!